Volunteers Paint in the Park It's nice to have volunteers to fix up playground equipment. 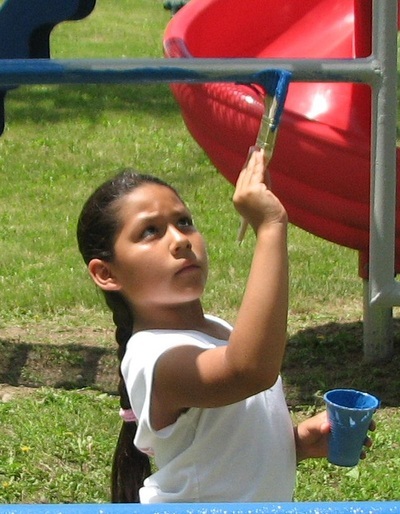 Michelle Antunez mentioned that the Scouts needed service projects and the smaller set of monkey bars at the playground needed paint. Michelle stripped the bars herself because the chemicals were caustic. Then the whole set was primed. 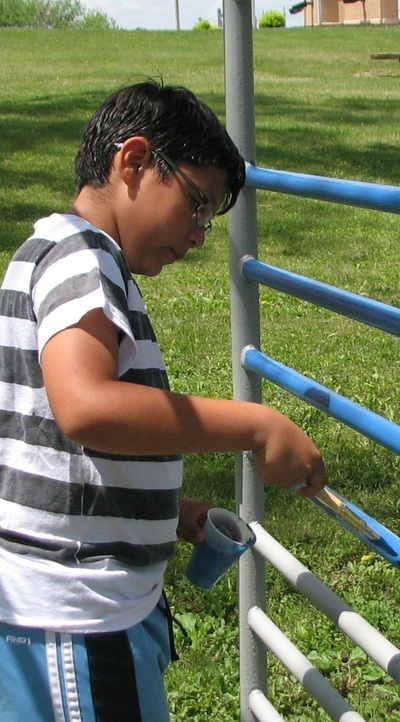 On Sunday, June 1 two small Antunez kids, Marcos is a scout, joined Michelle to paint with bright colored playground paint. 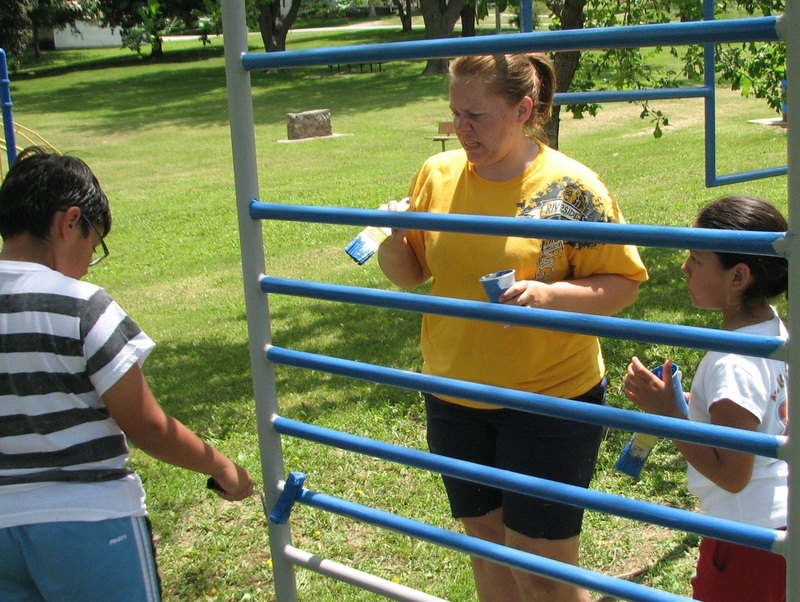 The two merry go rounds were painted earlier in May when the Riverside High School students came to volunteer. Michelle is not criticizing the paint job; the flies were biting due to the impending storm. Soon after the Macedonia Historical Society and the Centennial group decided in early Spring that Macedonia should celebrate its 100th Birthday, plans were underway! Each club was asked to help in some way, so the Helping Hands Circle and the L.D.T. Club decided to attempt to make a quilt, using the 1880 theme and the colors red, white and blue. Joan Scott, the town artist, designed the logo and buildings of interest, along with a car, a windmill, a horse and buggy and a train. Loren Cole designed the band stand. They were then transferred to quilt blocks by Donna Cole. During last February, March and some of April, the clubs' members embroidered the outlines in red and blue. Excitement began to build--we could hardly wait until each was completed! Then came the big day, Monday, May 12. Everyone had done their part! Each block was laid out on the bed, arranged and rearranged until it "suited" all. Then strips of blue 3 1/2" wide were sewn with a red square connecting each block. Another proud moment was when each block was joined with another to complete our historical display. Then came the job of putting it in a frame for quilting. Carl Peterson had the solution--frames that adjusted to different heights, perfect! Emma Keast donated the use of her basement for the project. It was more than appreciated! We worked when we could and left everything intact when we left for the night, not to be moved or disturbed until we were ready for work again (which would have been impossible in other places). It was a cool place, too, for some hot humid days of May and June. We put the quilt in on Monday, May 19, and finished it on Tuesday, June 3. The binding was done June 6, and our quilt was on display for the first time at the Ice Cream Social on Saturday, June 7. Instead of yard goods, we used sheets. The blue sheet was measured into the squares--and the white back sheet was "left as is." Polyester filling was used. We are sorry to report we found our eyesight not as good as we wished it could have been--and arthritis was taking its toll on the once nimble fingers. But we are proud of the finished "work of art." We hope it brings back many memories and will be a treasured "keepsake" for our Town of Macedonia, Iowa.